Are you looking for the perfect Devonshire wedding venue? 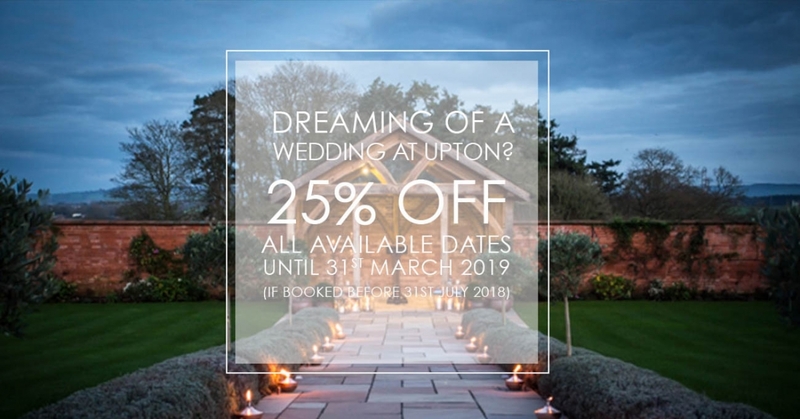 Upton Barn & Walled Garden has an amazing promotion running – Get 25% off a wedding on all available dates until the end of March 2019! But be quick, you have to book by the end of July 2018... so you only have a couple of weeks left to lock in that date and save yourself a huge chunk of your wedding budget! Nestled in the glorious Mid-Devon countryside, the award-winning Upton Barn & Walled Garden is a unique blend of traditional and contemporary architecture with four spaces that flow seamlessly from one to another. Having recently completed the final renovations of the Tack Room, it joins the Cider Barn and Press Bar, two stunning rooms overlooking the garden. And completing the venue is the new, architecturally inspired Stable Barn. With its striking lighting, warm timber interiors, well-stocked bar, glorious views across the paddocks and seating for up to 156, it’s perfect for a wedding breakfast. The space is now entirely and exclusively yours for a dreamy wedding, with captivating views across the fields to the Blackdown Hills. A unique rural idyll, it’s perfect for couples seeking a more rustic setting among the Devonshire landscape without compromising on style and luxury.